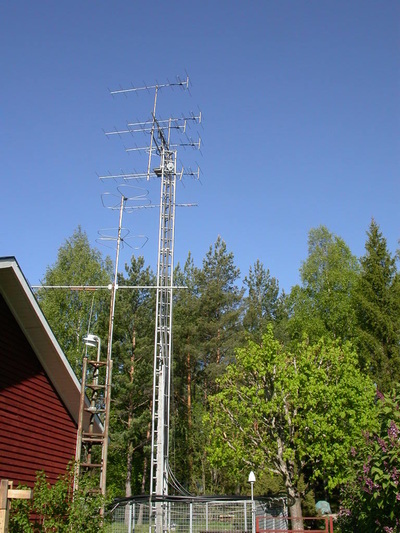 After the tower was up again 2002 and feeders mounted, I started to test different antenna constructions. From start 4 x10 el. 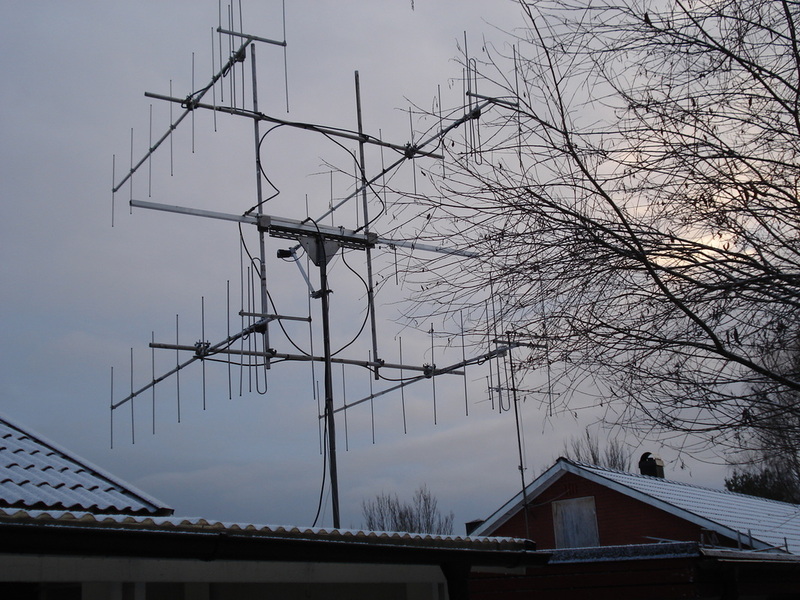 Wisi UY 12 1.6 wl (3.3m) boom, measured 10.8 dBd gain / ant. As I have two equal feeders down I decided to make two separated vertical stacked systems. I could now easily compare the difference between the one stacked for max gain, and the under stacked one. 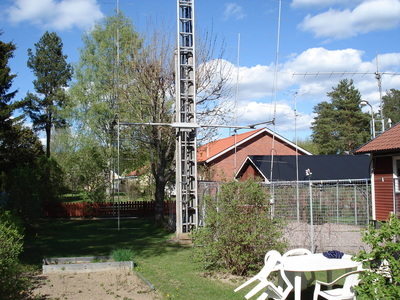 To the right the antennas stacked 2.1 m (1 wl) for max gain. 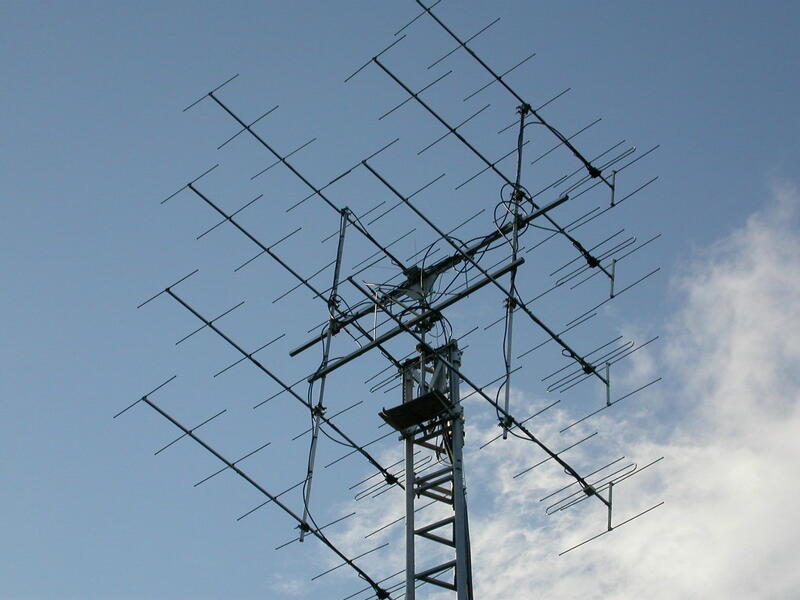 The left is stacked 1.5 m (0.7 wl), and below I added a 432 MHz KLM yagi for the balance. 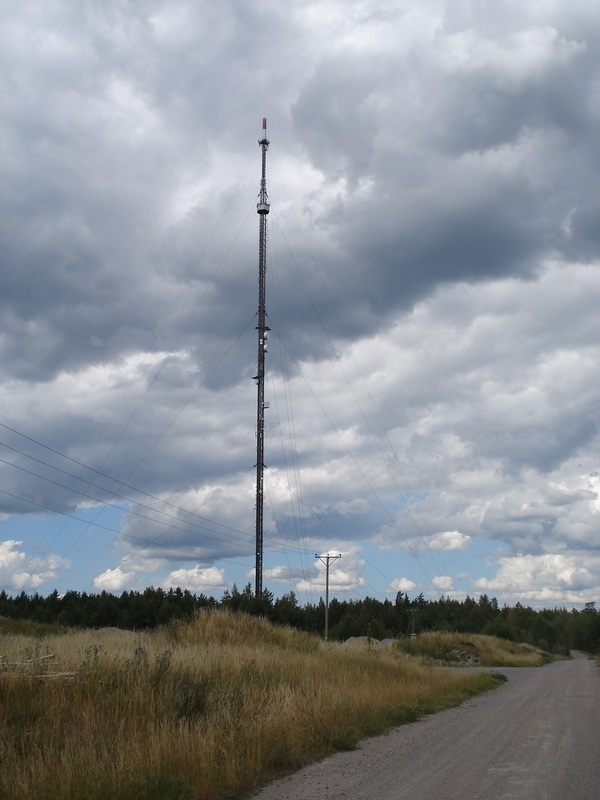 I wanted now to add two more antennas and understack them. 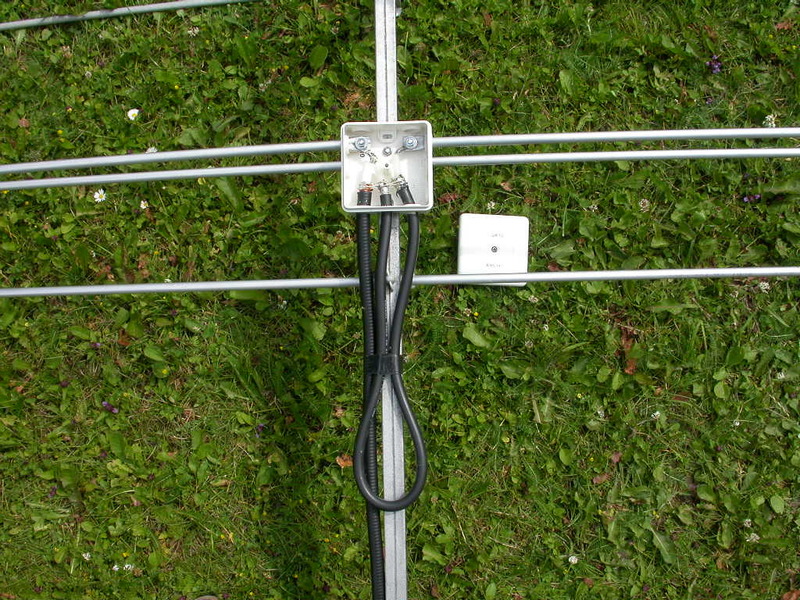 Some elements and one folded dipole was missing, so I had to make new ones (pict. above). I made two 4 -way power splitters and now I had two 4x10 el. 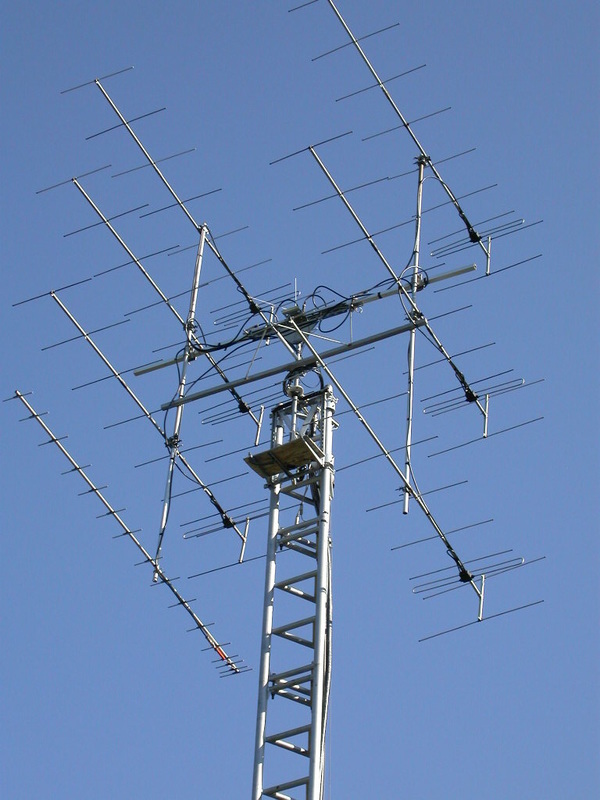 antenna systems. 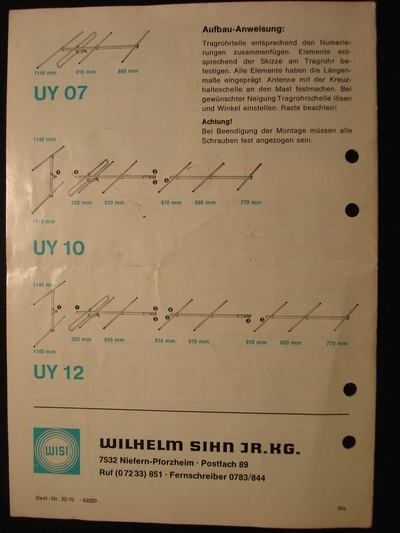 This is a useful combination as you can easy change the pattern in the horz. plane. 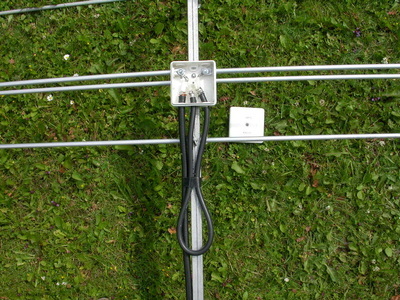 With a two way splitter inverted used down in shack, you can combine the two systems. All 8 yagis yielded almost 20 dBd gain, narrow lobe and good for working EME and Aurora. 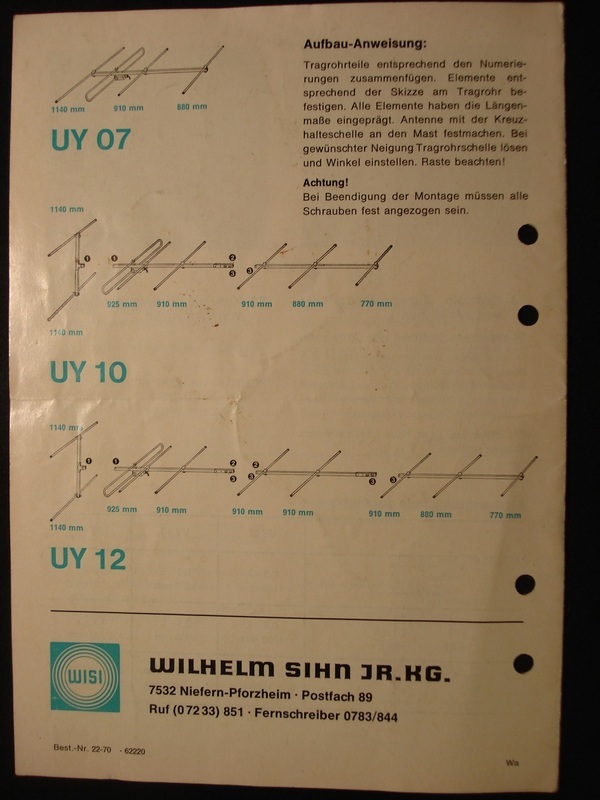 With some relays it was easy and quick to select only one of the two systems. The broad lobe made this to be an excellent antenna for working meteor scatter. Bursts was heard in the broad lobe long time after they disappeared in the narrow. 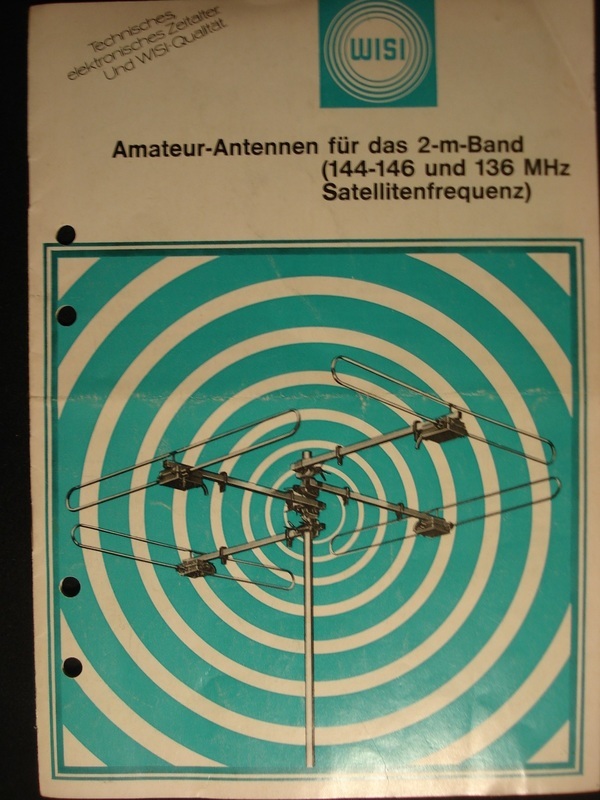 This configuration was also good to use in contests, like "zoom" in and add 3dB gain. 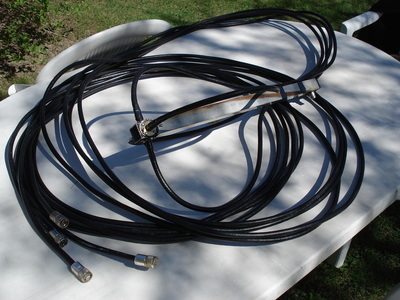 I had to make new jumper cables to the antennas and used low loss 50 Ohm. Each cable was cut to equal el. length and soldered to the 4 way splitter. 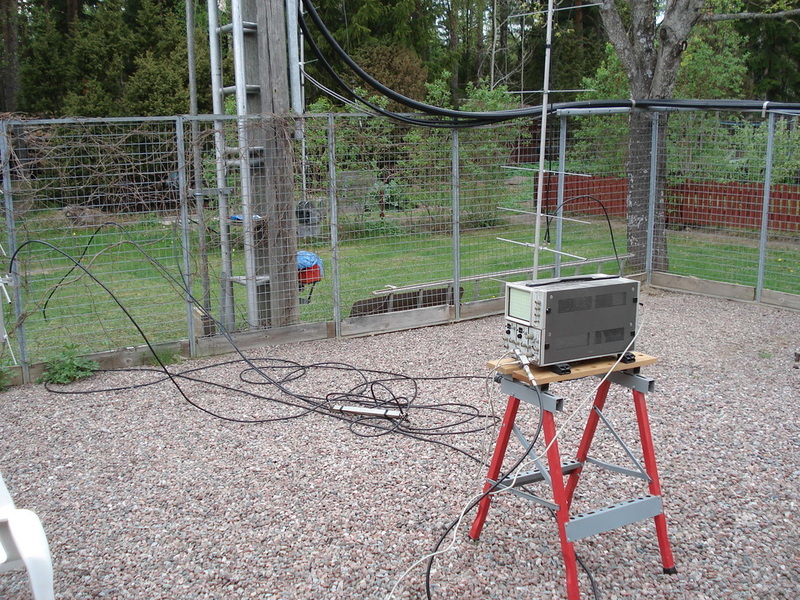 Each antennas Gamma match was measured and adjusted. 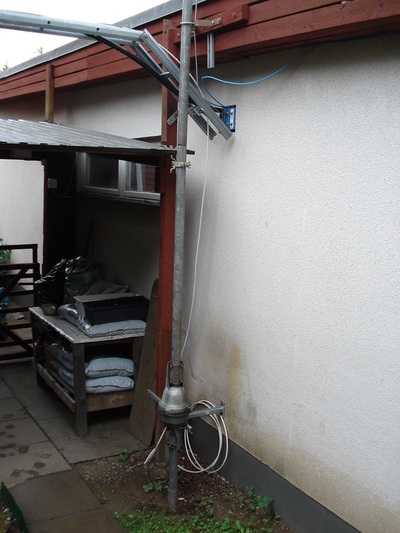 Control of the whole system to the feed point at the 4 way splitter. 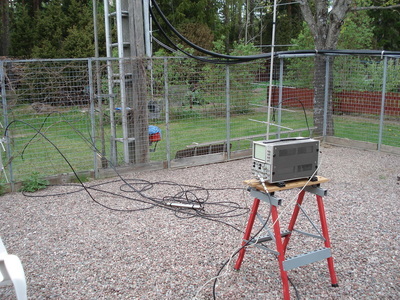 After all was mounted, controlled and measured return loss -25 dB. 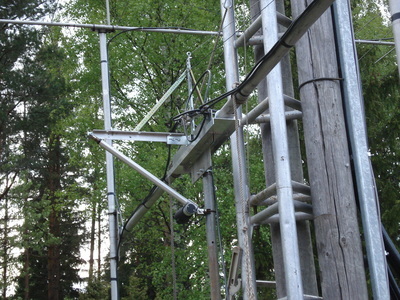 Time for the exchange of the antenna systems which was done in the same day. All went well, and the gain was almost the same as with the previous system. First side lobes -12 dB is normal with stacking for max gain, which I didn't see earlier. I now had several 10 el. yagis to play with and was interested to try some of them vertical polarized. 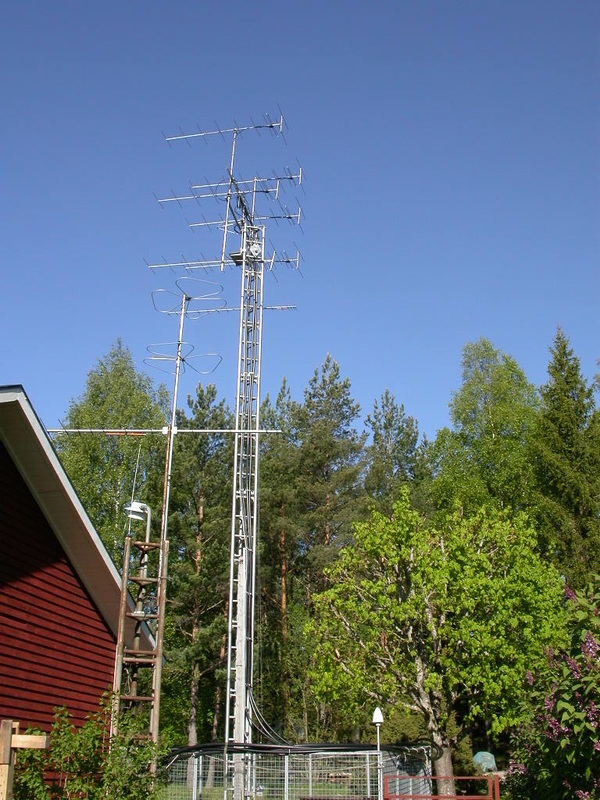 Beside the garage I mounted four of them temporary with azimuth and elevation control. 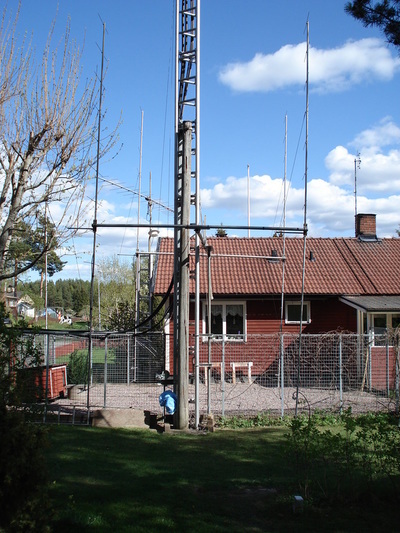 I could use the old cross boom with the elevation construction. The antennas were stacked for max gain 2.1 m vertical and 2.3 m horz. spacing. ​Sometimes I could see strong EME signals from the verticals, and nothing from the H pol. antennas. Next step was how to get them up in the tower. 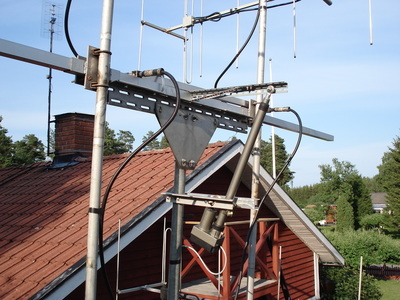 I had saved a couple of 2" fiber glass tubes from discarded GSM base antennas. Those were perfect to support the vertical yagis. 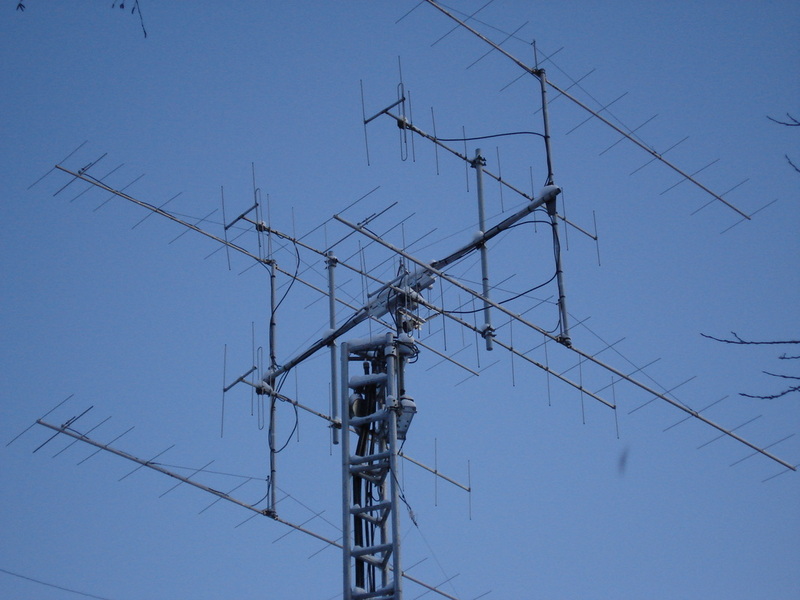 Stacking space of them are half of the H antennas, so I could mount them inside the H frame. The distances to the QueDees are 1/2 wl. After connection to the free 1 5/8" feedern, I could see no difference in the pattern or SWR at all. 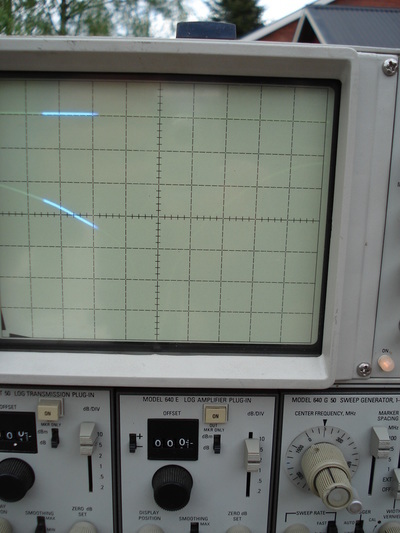 ​Both systems works all separate and seems not to interfere with each other. This is my current system. 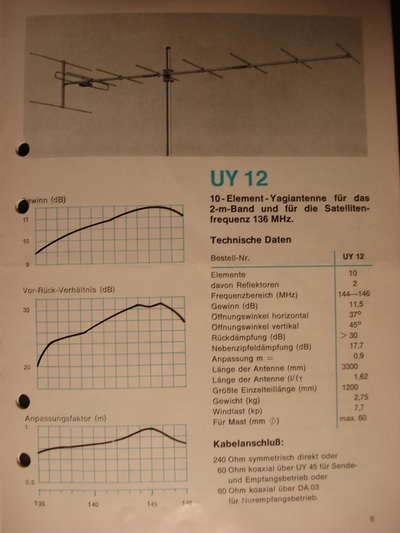 The 3 dB less gain from the V-antennas compensate more than well the level variation of the EME conditions. 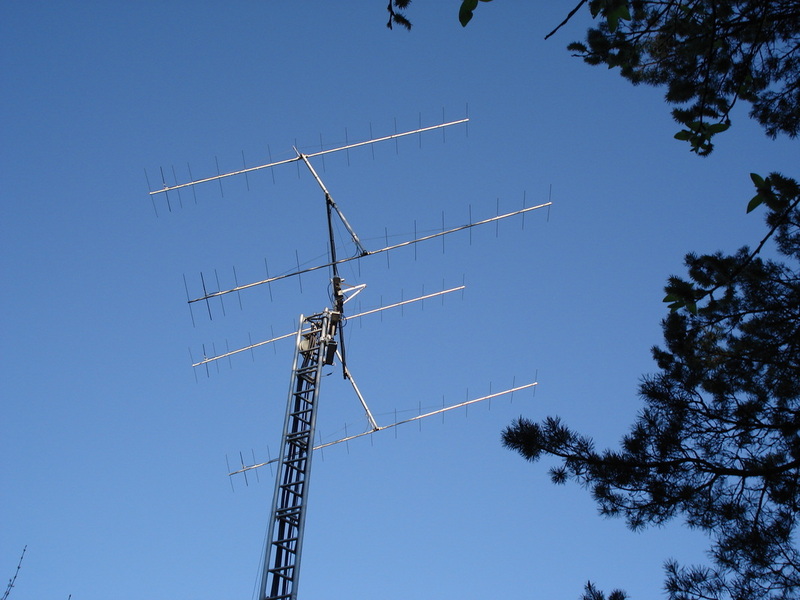 Sometimes I hear EME signals in the speaker from the verticals, and nothing seen on spectran from the H antennas. Half an hour later it can be the opposite according to the Faraday rotation.